History is not simply to be read about. It is something to be experienced. Wherever we go, and whatever we see, we can choose to experience the outcomes of history, or we can choose to be blind to the history that surrounds us. This is the story of a journey – a journey into history. It is also a journey into the present, and the future. For what we understand about the past, influences the way we think about the present, and what we plan to do in the future. Eventually, in a few seconds time, the future becomes the present, and then the past. Present, past and future are constantly in a state of transition from one to the other. Some months ago, at the beginning of 1998 I decided to travel half way around the world and back again. That, in itself, is hardly a startling event. Millions of people have done it. But why me? Why would I decide do such a thing? Well, all I can say is that in 1768 Captain James Cook was commissioned by the Royal Society to sail a diminutive wooden boat called the Endeavour around the world in order to observe the transit of the planet Venus across sun in the southern sky. It came to me, possibly in a dream, that I should also travel to the other side of the world to observe Venus. 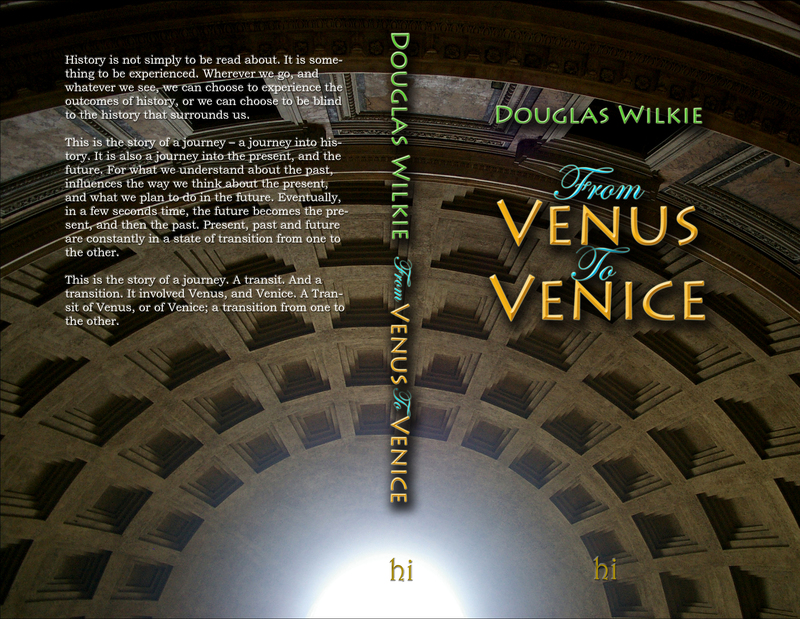 The problem with all of this is that my dream was rather vague, and I have never really been too sure whether it was Venus or Venice that I was to go to observe. In fact, I am not even certain whether it will be a transit or a transition that I will be observing most of. So, here I am at the airport. I am off to observe the Transit of Venus; or the Transition of Venus; or possibly the Transit of Venice; or maybe even the Transition of Venice. Which it will be I am yet to discover. It is six-thirty in the evening of Saturday the twenty-sixth of December. I am boarding a KLM Boeing 747-400 at Sydney airport and flying to Milan in Italy. The plane will leave at about seven. Five hundred years ago, when working for the Duke of Milan, Leonardo da Vinci designed a machine that he hoped would enable a man to fly through the air like a bird. He carefully studied the flight of birds and the mechanics of their wings and applied this knowledge to his designs. Leonardo’s flying machine never actually took off, but that is probably not the point. The wonderful thing is that he bothered to spend the time investigating such a thing; to spend the time working out the reason that things stay up or don’t stay up. The reason that things fall out of the sky. Perhaps that was for Newton to discover. Is it the ability to reason that man shares with God and makes us different to other creatures? The ability to recognise the laws of nature and to explain the world around us? Leonardo, were you at the forefront of this investigation of the universe? Was it men like you who began the age of reason? The age where everything had to have a reason. The age where anything that could not be explained in rational terms was not worthy of consideration. Perhaps we would be better off sometimes if we didn’t want a reason for why things happen. Why am I going to Milan? Is there a reason? Perhaps I will know the answer only when I discover the nature of the question. Leonardo did not plan his flying machine to have on-board films, toilets, lunch, dinner and breakfast, and a multitude of other services. Today my flying machine has all of these. I have never been in a 747 before. I am impressed by its size, but disappointed by the cramped conditions. I have the impression that there are too many passengers. There are close to four hundred. There are too many seats crammed into the plane. Take out eighty or a hundred seats. Make more space. It would be much more comfortable. But, this is the way it is, and I find my seat. It is about half way along the plane. Row forty-five. Seat ‘B’. That makes it the centre seat of three next to the left-hand windows. It is just in front of the wing. I am apprehensive as we take off and steadily climb to a height of over 11,000 meters above the ground. Yes, I have flown before. But this is something different. There is always the possibility that the gravity of the earth will do what it is meant to do and pull this relatively inconsequential cylinder of metal towards the ground at a velocity that will inevitably result in a million fragments being spread over a very wide area. But the engineers, the latter-day Leonardos, have worked it all out, and the jet engines manage to keep the plane flying through the air at a speed of nearly one million meters each hour. It’s not easy to do that, and the sound of the jet engines make it quite clear just how hard they are trying in their battle against the forces of gravity. There must be a better way. Somebody will invent an anti-gravity machine one day. Perhaps somebody will invent the means of sub-atomic particle transmission and we will simply disappear from one place only to reappear in another place. Perhaps even another time. Today I am travelling in space. Maybe I will also travel in time. I begin to think about the possibility of the plane crashing. It is not the first time. Several weeks ago I thought about it. If I am going to die what preparations should I make? I thought about that. And I wrote my Last Will and Testament. The emphasis is, of course, upon the word Last. But I want the emphasis to be on the word testament. I wanted it to be a testament to many things. So I wrote it, and rewrote it. It became something of an autobiography. It was long. In the end I sealed two versions of it in an envelope with the hope that, if it was ever read, people could actually work out what I really wanted. … I sealed it up and left it on the shelf at home. I had been reading Keats before leaving, because he went to Rome and wrote about his experiences. He also once wrote to his friend Fanny Brawne in 1820. If I should die I have left no immortal work behind me—nothing to make my friends proud of my memory—but I have loved the principle of beauty in all things, and if I had had time I would have made myself remembered. I wonder about the same unanswerable question. Although, in the end Keats is remembered and his works are read, and loved. Eventually I put my mind to thinking about other things—like the growing discomfort of sitting in a cramped centre seat for twenty-four hours. I settle down to reading; or watching the progress of the journey on the overhead video screens; or just looking out the window at the passing parade of clouds. The stewards seem to be constantly asking whether I would like another drink or something to eat. I always accept their hospitality and in this way I collect a number of bottles of French or Italian wine for later consumption. Eventually the machine does allow gravity to take over and it descends rapidly toward the ground. Soon it lands on the tarmac at the Malpensa Airport just outside Milan—the place where Leonardo had designed his original prototype. It is a relief to be out of the confined space. It is a relief to walk on solid ground again. But Milan is not my final destination, and the four hundred passengers of flight AZ797 are not the only people to arrive at Milan. Another three flights arrive within minutes of each other pouring out a thousand passengers in a mass that overwhelms the Italian customs officials. Accurate checking of baggage is forgotten. Stamping of passports becomes irrelevant. The officials simply wave the new arrivals through their checkpoints as quickly as possible. I look at my watch. It tells me that the time is six-thirty on Sunday afternoon. The flight has taken nearly twenty-four hours. I look at the clock on the Milan airport wall. It tells me that the time is eight-thirty on Sunday morning. Somewhere I have saved ten hours. How far would I have to travel to save a whole day? Or a week? Or a year? Can I travel back in time to an era long gone? I think of Umberto Eco’s novel The Island of the Day Before. What has happened to time? I do not have time to consider the answer just now. Time flies and I must catch another plane.